The Solstice Scents Late Summer release goes live at 7 pm EST tonight at http://www.solsticescents.com. Most of the perfumes are perfect for transitioning from the still sweltering days of summer into the early days of the fall season. There are 3 new fragrances that will be offered, along with a variety of recurring returning favorites. The brand new scents are listed first below, followed by the returning scents. At the very bottom of the post is a list of additional restocks and Glaces that will be available with this release. As posted about on social media this week, we have been dealing with a waylaid international parcel containing a component that is necessary for the formula of 2 of the 5 brand new scents. This issue has been going on for many weeks and we delayed our release to this weekend in the hopes it could be resolved. These 2 scents will not be mentioned in this post or released with the other 3 new scents as originally intended. The parcel is set to arrive this week and should it pass quality control (they sent the wrong thing last time), we will release the following 2 scents as soon as possible. They're ready to go aside from this one very necessary component! 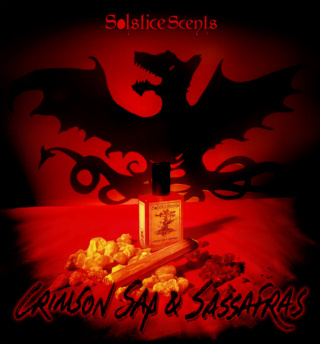 Crimson Sap & Sassafras is a deep dragon's blood forward perfume. Sassafras has a distinctly root beer meets birch scent. It pairs remarkably well with the deep, spicy, resinous and cola aspects of dragon's blood. Crimson Sap & Sassafras is further enhanced with a beautiful palo santo essential oil, frankincense resin, anise, fluffy marshmallow, sticky benzoin, a touch of vanilla cream soda and deep crimson musk. The cream soda is subtle and enhances the root beer to read reminiscent of a root beer float. The anise is present but never overshadows the robust sassafras heart note or the deeper spicy resins. Palo santo reads as dry, woody and sacred and adds a complex top note to the sassafras. Crimson Sap & Sassafras is a full-bodied and rich unisex perfume. It will be offered in perfume oil, Eau de Parfum (excellent performance on fabric), Whipped Soap and Burnishing Glace. As this perfume does contain moderate spice notes, please use caution when applying immediately out of the shower (when pores are open and skin is more sensitive) and perform a patch test if you're historically very sensitive to even moderate amounts of spice. 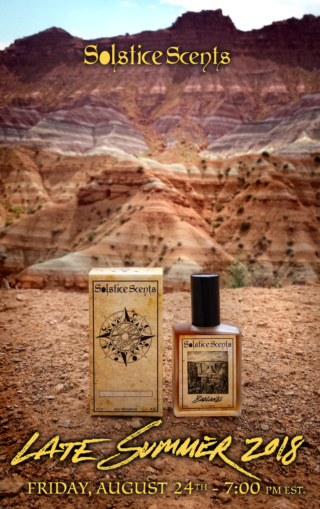 Badlands is a very dry fragrance composed of primarily sun-baked woods, well-worn brown leather, sand, palo santo, hot resins, juniper wood, sandalwood, ponderosa pine cone, parched desert plants and grasses and a very light thread of spice. Upon initial application, top notes of wild desert plants (including a bit of sagebrush) and palo santo ride the crest of a deep warm woods and brown leather base. Melting myrrh, hot Earth, faint spice and juniper wood and berries join the other notes to create a desert atmospheric that is different from our previous interpretations. When you close your eyes, you should imagine heat waves coming off of a wide open plain of scorched sand, a sun baked rolling wooden cart, hot leather and sparse desert plants. Rosewater, saffron, cardamom, coconut vanilla custard, caramelized sugar, dates, pistachios, lime zest. 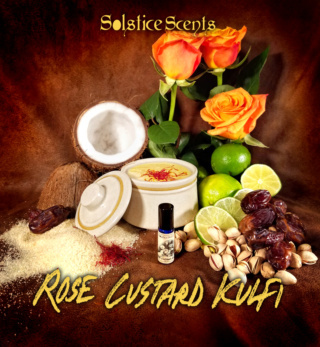 Rose Custard Kulfi is a loose interpretation of the Indian dessert kulfi, with a twist and quite a few additional embellishments. Rosewater, saffron and cardamom infused coconut vanilla custard is topped with caramelized sugar, chopped dates, crushed pistachios and lime zest. It's sweet, lightly rosey, a bit of custard, bruleed sugar and tons of sticky dates. This gourmand perfume opens with a burst of lime that is quickly followed by rose, sugar and custard. The pistachio peaks out as a top note after a very shirt time on the skin, lending a faint touch of nuttiness. There is actual pistachio CO2 in this perfume so please be advised if you have a nut allergy. The cardamom is very faint. This perfume opens with a well-blended and complex note profile where it is challenging to isolate every note in the blend. Each time you smell it, you will pick up something different and may identify each note over time. The blend evolves fairly quickly and dries down to mostly carmelized sugar, dates, a touch of vanilla and a very faint hint of creamy custard. Our testing shows that the perfume oil format showcases the scent marginally better on skin than the Eau de Parfum format. The EDP opens slightly different than the oil and shines best on fabric. The differences are nominal but you may wish to try one or the other, depending on how you prefer to wear perfume (skin versus fabric) - or try both versions! Perfume oil and Eau de Parfum only. Sun-ripened strawberries, fine aged patchouli and a hint of strawberry leaf and morning dew. If you like Earthy fruit scents like our Cellar fragrance, this one is for you. Strawberry Patch isn't as dirt and Earth focused as Cellar though. Its got a large heaping of strawberries, but you can smell the patchouli as well. Strawberries are showcased in a more garden-focused than gourmand or candied interpretation in Strawberry Patch. Sweet papaya, a mélange of tropical fruits, plumeria blossoms, a touch of plump strawberries and a subtle undercurrent of ginger root. Fruity, tropical and a touch of floral, Sinopia evokes the feeling of sitting on a remote stretch of beach while watching the sun descend from a sky splashed in vibrant fiery red, orange, pink, yellow and purple. Sinopia is a limited release that will unfortunately not be able to be restocked. Fresh watermelon granita, cool cucumber and sprigs of garden mint. The watermelon is in the foreground with cucumber juice and peel just behind. The mint is soft and invigorating. This differs from our other watermelon-forward Whipped Soap called Florida Fruit Stand in that the latter features a fruit medley approach with banana, strawberry and citrus. 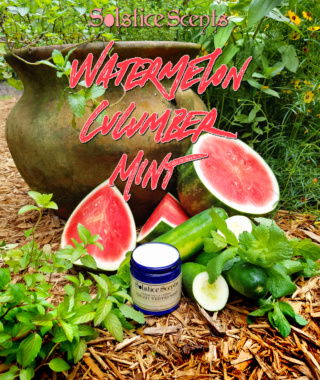 Watermelon Cucumber Mint focuses on cooler tones, the bracing and refreshing mood of a watermelon granita and the cooling properties of cucumber and mint leaf. Refreshing, sweet, watery and green. 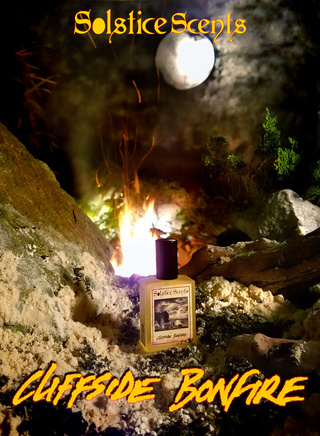 CLIFFSIDE BONFIRE PERFUME: Conifers, dry woods, rain, saltwater, seaweed, ambergris (vegan), charred wood, smoke. On initial application, a woody, coniferous blast gives way to crashing waves with fat raindrops just on their heels. Cliffside Bonfire is a forest aquatic with a touch of petrichor and some warm wood smoke. The smoke is nowhere near as strong as in our Smoky Mountain Mallow or Manor Fire perfumes. The main body of the perfume is a dry and woody blend with a generous dose of sea spray, a periphery of conifers followed by light charred wood, embers and a bit of wood smoke. The dry woods and smoke are more apparent as the blend morphs and moves into the dry down. The rain undulates back and forth as a top note, shifting in front of and then behind the saltwater, then again. It dissipates to make way for warm, dry woods, a toasty fire and an undertone of saltwater and pine. 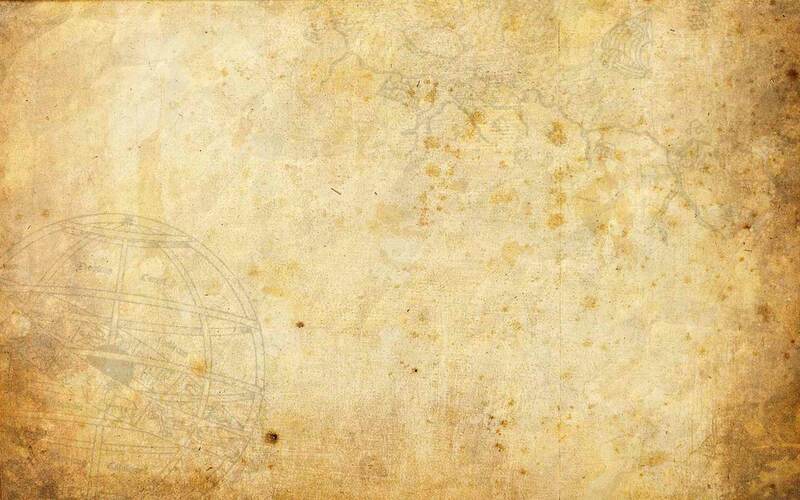 Ponderosa pine, sub-alpine fir, tamarack, swiss stone pine, spruce, Siberian fir and others are used alongside juniper wood, Port Orford cedar, blue cypress, seaweed, ambergris, oud, moss, fossilized amber, birch tar and more in this mixed media perfume. While there are several synthetics used in Cliffside Bonfire, the majority of the formula comes from natural materials. Offered in perfume oil and EDP format. Technically a Spring Collection scent, we have only recently been able to source one of the oils in this blend so we were unable to offer this scent in the spring. Blossom Jam Tea Cakes returns with the summer collection for those who missed it in spring. Blossom Jam Tea Cakes features the mouthwatering aromas of Petit Fours filled with floral infused jams and preserves, enrobed in sweet fondant, warm southern tea cakes topped with a delicate lavender buttercream and a subtle waft of hot tea. A rich cakey base supports light floral and fruit notes to create a beautiful atmospheric spring gourmand floral fragrance. Notes include: yellow and white cake, honeysuckle absolute, palmarosa EO, peach, strawberry, blood orange EO, lavender absolute, ylang ylang absolute, buttercream, fondant. The floral notes listed may give the impression that this is a heady floral but it's not. Rather, the floral notes were used with restraint and were intended to infuse the delicate fruit notes to create an interpretation of floral jams and preserves thinly spread on fluffy cakes. If you enjoyed the palmarosa in our Victorian Tea Room, you'll notice it here. BJTC layers really well with Estate Vetiver, if you like to darken your gourmands up. Palmarosa and vetiver make a beautiful combo! Perfume Oil and Burnishing Glace Bath and Body Oil. Old Havana is an exquisite, sophisticated and elegantly refined tobacco scent with all of the nuances of the highest quality handmade premium cigars, carefully aged and stored at optimum temperature in a Spanish cedar lined humidor. This fragrance illustrates the wrapper, tobacco within and wooden cigar storage box. Old Havana also features warm spices, a delicate squeeze of fresh lime top note and a splash of salty sea spray and moist beach sand. The lime is very subtle and detectable upon cold sniff and initial application. Beyond the opening, the smooth tobacco, soft woods, spice and sea spray swirl in an intensely beautiful, mysterious and realistic fragrance. EDP. Offered as a part of our General Catalog in perfume oil format. SUN-WARMED HONEY: Honey, apricot nectar, strawberry juice, chamomile, ginger, orange blossom flowers. This perfume contains a blend of top quality fragrance oils, natural apricot and strawberry essences, Roman chamomile EO, ginger EO and Kunzea EO. Not to be used by women who are pregnant or nursing or those with hayfever (contains chamomile). LIME ESSENTIAL OIL MAY CAUSE PHOTOSENSITIVITY AND IS NOT RECOMMENDED FOR APPLICATION PRIOR TO EXTENDED SUN EXPOSURE. DO NOT APPLY IMMEDIATELY AFTER A HOT SHOWER OR NEAR CUTS OR BROKEN SKIN AS LIKE LEMON JUICE, LIME MAY STING! Nighttime island breeze carries sweet coconut flesh, delicate tuberose blossoms, Tahitian Gardenia flowers and pressed lime juice.Tropical Moon smells like an exotic beach paradise. It is sweet with creamy white floral notes with a top note of lime peel. Contains real tropical monoi (Tahitian Gardenia blossoms infused in fragrant coconut oil), mouthwatering lime essential oil a blend of synthetic fragrance oils. Initial application has equal parts of coconut and tuberose with the lime hovering just above. The lime burns off relatively quickly in the leave on formats but does have a gentle presence in the whipped soap. The dry down is a fairly constant blend of coconut and tuberose without a great deal of morphing that translates as a soft and creamy tropical fragrance. Offered in perfume oil, Glace, Whipped Soap and EDP. FLORIDA FRUIT STAND WHIPPED SOAP: Watermelon, banana, strawberry, blood orange, lemon. Watermelon and banana are the dominant notes. The strawberry, blood orange and lemon are subtle. (Whipped Soap only. Not recommended for use prior to prolonged sun exposure due to citrus content). ROOT BEER FLOAT WHIPPED SOAP: Root beer, vanilla bean and vanilla ice cream. Very strong and refreshing root beer soap! (Whipped Soap only).